If this was a food blog, which it isn’t, I would definitely use this little clock as the background, or the header, for the site. If I should ever write a cookbook, which isn’t likely, I would try to figure out how to use it on the cover. I love this clock, and yet, I have never actually used it for its intended purpose. I made it several years ago during a time when I was experimenting with clay and wood. And some other mixed-media stuff. If I must say so myself, it turned out rather nicely. It was around the time that I seemed to be going through a phase where I made a lot of clocks. 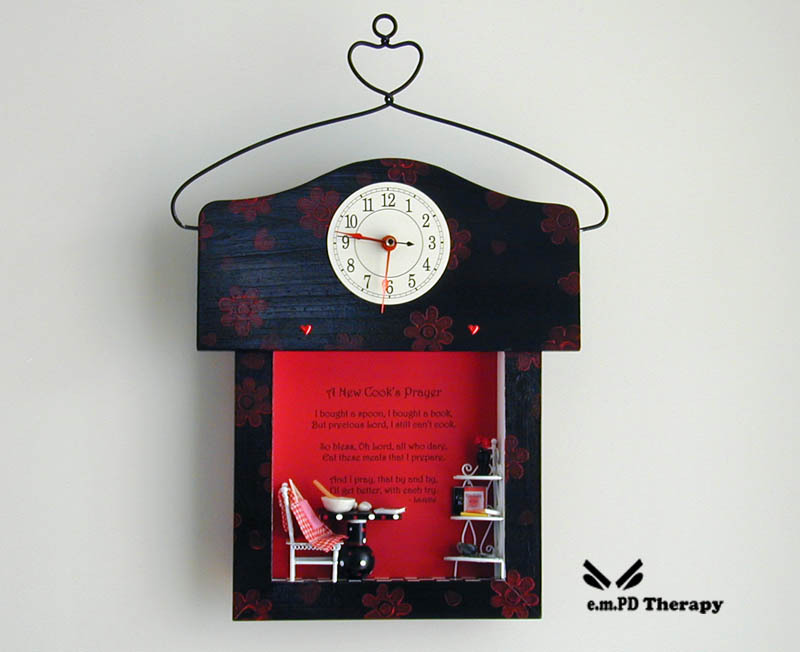 And not just any clocks, I made “unusual” clocks. There was one that was made using an old CD with bead trim, a wooden dowel, and pieces of leather. It looked like a giant flower. A giant ticking flower. There was also my painted masterpiece that became a framed canvas collage clock covered with window screen – I’ll bet you can’t say that three times really fast without messing up. And I really liked the old copper teapot that found new life as a clock. I would love to post the pictures, but they have proved to be …elusive. Of all the clocks I have ever made, this Kitchen Clock is my favorite. I especially love the poem, “A New Cook’s Prayer”, printed on the background, and you can read it below. I briefly considered writing the design instructions, just in case somebody wanted to replicate this little darling. Unfortunately, instruction writing has always been my least favorite part of the design process. So I didn’t. I’m thrilled, however, that I happened to find this picture in my files, and I wanted to share it here. On my “not a food blog” blog. Today is Mother’s Day. As I remember my own mother, I’m feeling just a touch nostalgic. 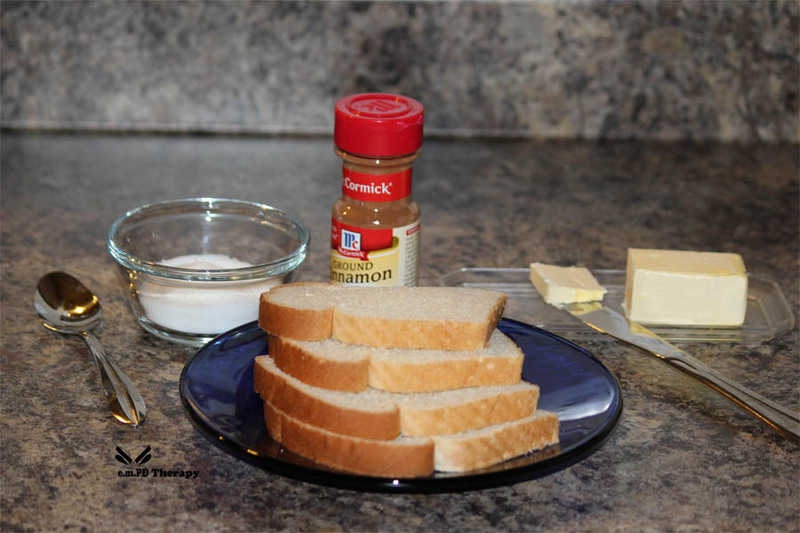 On a day when most people may be thinking of flowers, and jewelry, and a special dinner Mom doesn’t have to prepare, I’m thinking about Cinnamon Toast. 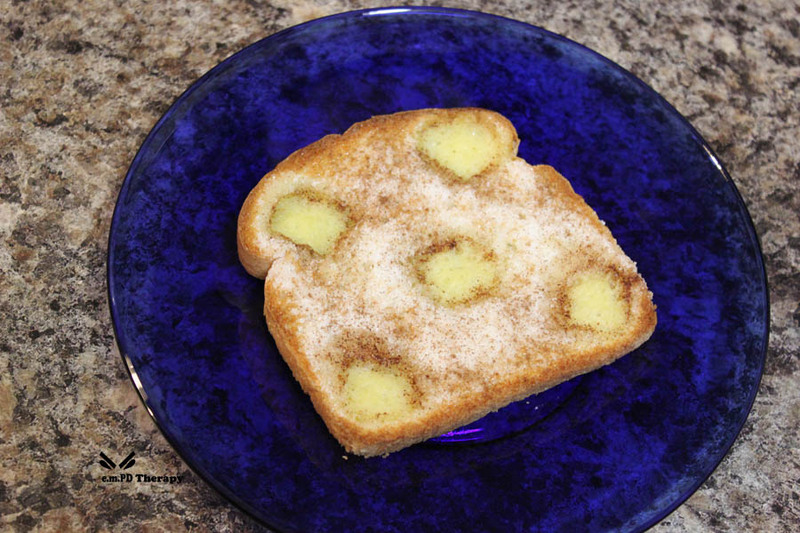 My mother introduced us to Cinnamon Toast, just as her mother did for her. She had a special way of making it with a little square of butter in each corner of the bread, and one square in the center. It looked like the 5-spot on a domino. Sort of. After getting the butter just right, she would sprinkle everything with granulated sugar and a light dusting of cinnamon. 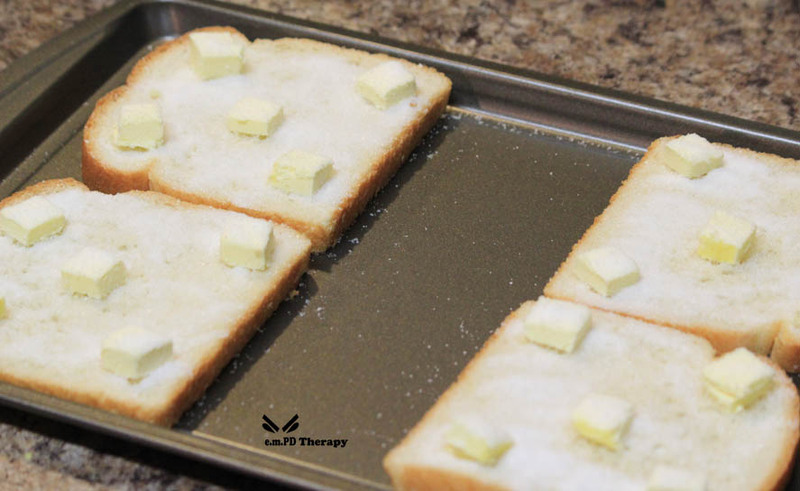 This was placed under the broiler for a few minutes until the butter was hot and melty, and the bread was toasted to a light golden brown. As it cooked, the sugar and cinnamon would transform into a magical blend of sweet, crunchy goodness. Yum! As soon as it was cool enough to touch, she would cut it into triangles and we would dig in. It just doesn’t taste the same if it isn’t cut into triangles. I’m sure there must be hundreds of recipes for Cinnamon Toast, but I wanted mine to look and taste the way it did when my mother made it for us back in the day. 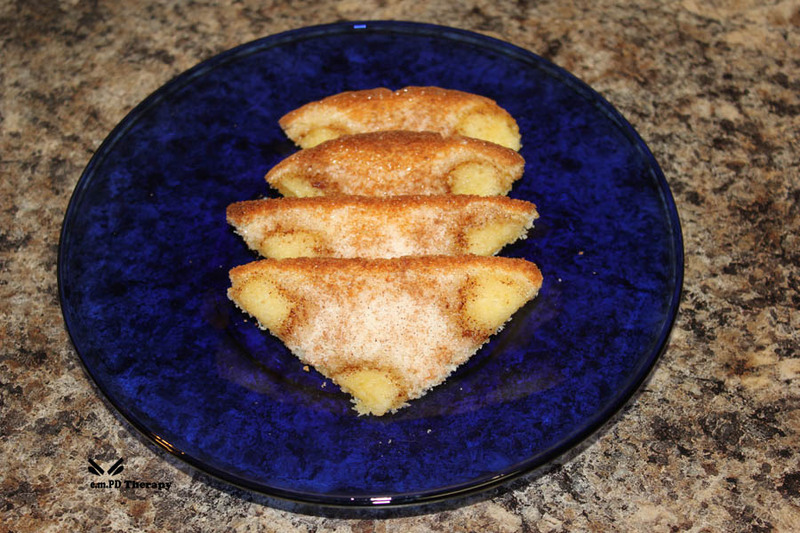 I made this special treat for my children on several occasions when they were little, and they loved it. I wonder if they will look back on those memories someday with the same nostalgia I’m feeling. I wonder if they will serve it to their children, and tell them how my mother taught me to make it, just as I taught them. I wonder if the tradition of Cinnamon Toast will continue for generations to come. I certainly hope so. 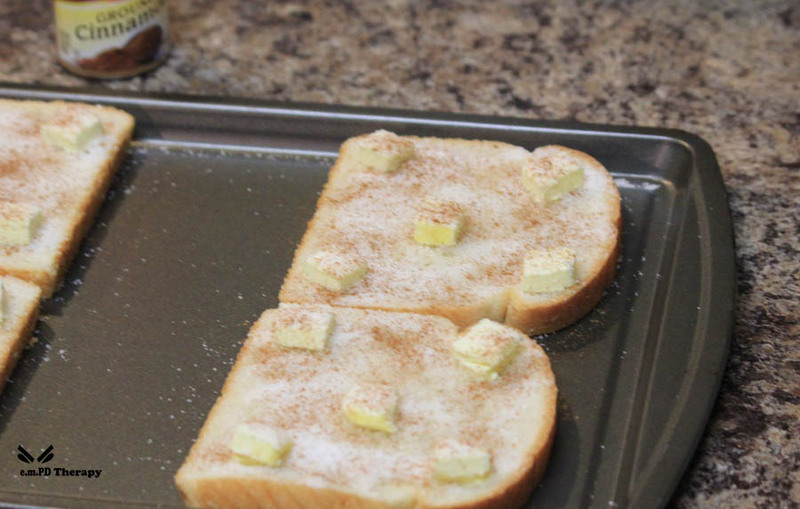 And meanwhile, I’ll have to call my children and tell them to come over for breakfast, I’m making Cinnamon Toast. I own beautiful serving dishes, but I don’t use them for everyday salads. These are real pictures, of a real salad, that I really ate. All of it. I took these photos back when I tried that take-a-picture-of-everything-you-eat-and-lose-weight diet. It didn’t work. But I have lots of food pictures now, so I might as well get some use out of them. The brand names you see are what I happen to use, no promos here. Now that we have all of that out of the way, let’s talk salad! In all honesty, I don’t really care for lettuce as a stand-alone food item. It’s great for sandwiches, or wrapped between a tortilla and some grilled chicken, or for adding color and crunch to a burger, or, as used here, to host the other ingredients of a hearty salad. So, lettuce make salad. (You should know by now that I can’t resist an easy pun.) ChefDeHome mentions on her blog that there are many different kinds of lettuce, and they all have a certain flavor. Some flavors are better than others – my words, not hers. I don’t like the varieties that have a bitter after-taste to them. Fortunately, I discovered Sweet Butter lettuce a couple of years ago and I really like it – as far as lettuce goes. I always start by washing my lettuce, even if the bag says that it has already been washed. 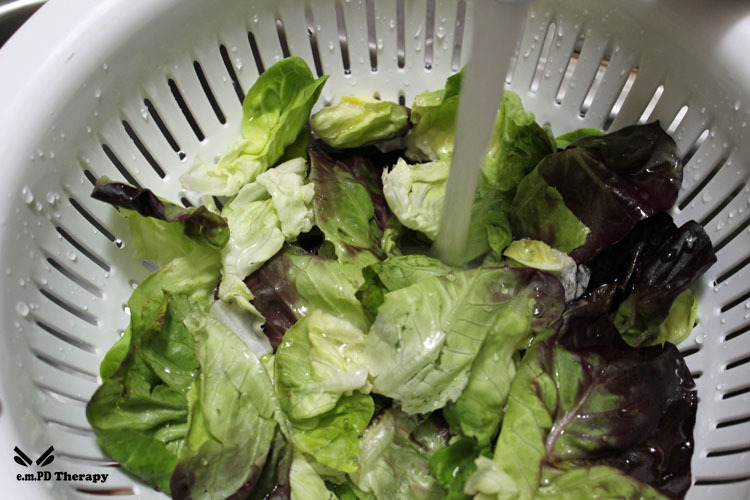 If the idea of wet lettuce offends you, you can toss it around on paper towels to get rid of the excess moisture, or invest in one of those salad spinner thingies. Draining it in the colander works well enough for me, and a little dampness helps with the next step. Since I didn’t use the whole bag, I estimated about 20 calories for the lettuce. There was a time when I would just turn a bottle of dressing bottoms up and squeeze. I love Ranch Dressing. In an effort to change my wanton ways, I switched to the light version, and now I only use one tablespoon of the delectable delight for an entire salad. A trick that I like to use is to toss my lettuce with the dressing before I add the other ingredients. This, along with a little dampness from the washing, improves the chances of getting dressing on all of the lettuce. I have tried that technique where you dip the tip of your fork in the dressing, pinkie up, and then spear a big bite of salad – that doesn’t work for me. I’m an equal opportunity dressing-er and I believe each leaf should be coated equally. 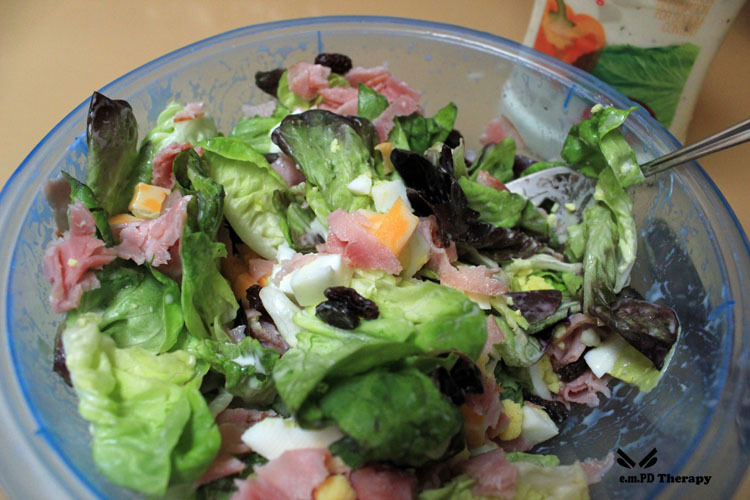 Next, I will chop up the rest of the ingredients, if needed, and add them to my salad in no particular order. Sometimes I rinse my raisins, sometimes I don’t. But I will remove any wayward stems that managed to survive processing. And there you have it folks. 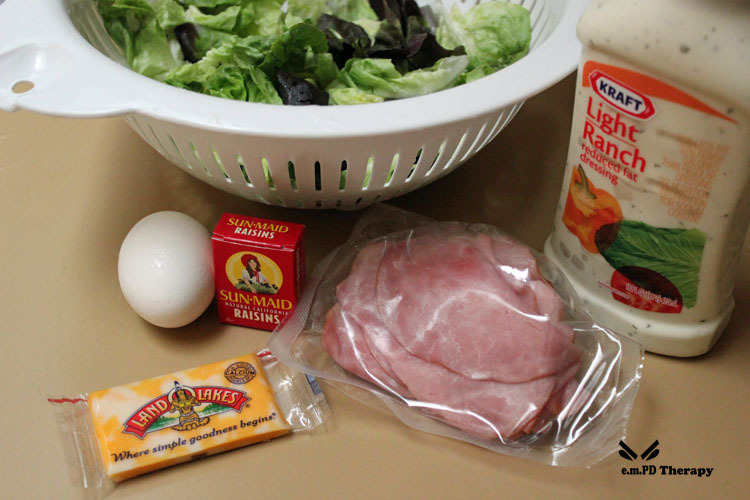 What started out as a plain, unassuming bag of lettuce is transformed into a hearty meal with calories to spare. I love the way the flavors blend with the textures to create a medley of yumminess. Bon Appétit! I'm just an Owl trying to make it in this Early Bird world. I'm dealing with early morning Personality Disorder...and other issues surrounding the sleep-wake cycle. You can call me Gert, and this is my Therapy Journal. Welcome to my world. Back to the Future Anyone? 2013 – 2018 All content on this site is protected under the laws governing copyrights and trademarks. All rights reserved.